The reindeer in Finland might not be able to guide Santa on his sleigh, but they will soon be visible even in the dead of night. Finland’s huge reindeer population leads to an alarming number of traffic accidents: an estimated 3,000-5,000 every year. The country’s Reindeer Herders’ Association is turning to a rather unorthodox method to keep those pesky animals from playing their reindeer games that end in injury: they’re painting their antlers. 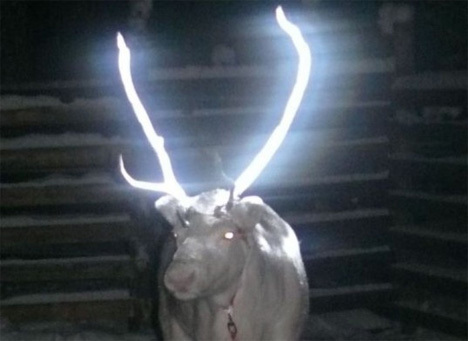 The painted antlers idea actually evolved from former attempts at keeping reindeer and motorists safe. 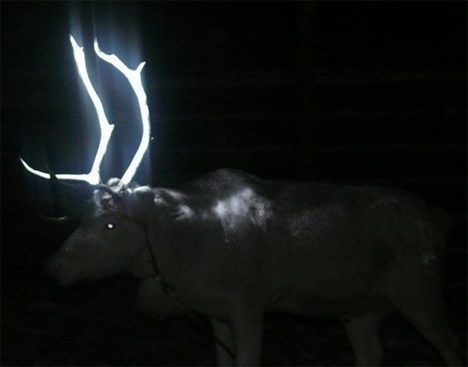 The RHA tried applying reflective tape to the antlers and reflectors to the animals’ bodies before coming up with the truly brilliant idea to spray the reindeers’ antlers with glow-in-the-dark paint. 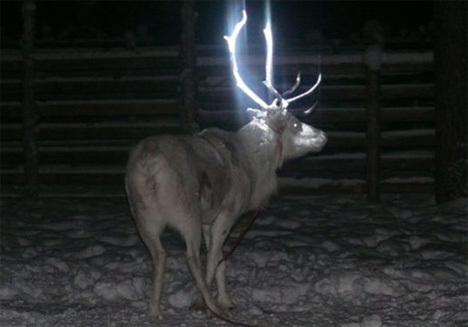 The association has also tried to paint the reindeers’ bodies with the glow-in-the-dark paint, but decided that the antler painting is a much more effective method since the antlers can be seen no matter which way the animal is facing. A limited trial involving 20 reindeer got the project started in Lapland, located in northern Finland. Further trials will be carried out to test the effectiveness of the permanent glowing paint, but it seems that the association is so far pleased with the results. See more in Weird Science or under Science. February, 2014.